Download "VISA SCORECARD/VISA DOUG MILLER CONSUMER CREDIT CARD AGREEMENT"
2 also promise to pay all finance charges and other charges added to your account under the terms of this Agreement or another agreement you made with the Credit Union. If this is a joint account, the paragraph on JOINT ACCOUNTS also applies to your account. 4. PERIODIC RATES The periodic rates applicable to purchases, cash advances, and balance transfers are disclosed on the Disclosure that accompanies this Agreement. Any penalty rate that may be imposed for failing to make a payment by the payment due date is also disclosed on the Disclosure. Any rate change will be made pursuant to applicable law. If the rate for your account is variable, as indicated on the accompanying Disclosure, the rate charged on purchases, cash advances, balance transfers and any penalty rate will vary periodically as disclosed in the Disclosure accompanying this Agreement. The initial rate on your account for certain types of transactions may be an introductory discounted rate (Introductory Rate) that is lower than the rate that would ordinarily apply for that type of transaction. If an Introductory Rate applies to your account, the rates and the period of time it will be effective is shown on the Disclosure accompanying this Agreement. After the Introductory Rate period expires, the periodic rate will automatically increase to the rates that would ordinarily apply for that type of transaction based on the terms of this Agreement. 5. FINANCE CHARGES VISA DOUG MILLER New purchases posted to your account during a billing cycle will not incur a finance charge for that billing cycle if you had a zero or credit balance at the beginning of that billing cycle, or you paid the entire new balance on the previous cycle's billing statement by the payment due date of that statement; otherwise a finance charge will accrue from the date a purchase is posted to your account. To avoid an additional finance charge on the balance of purchases, you must pay the entire new balance on the billing statement by the payment due date of that statement. New cash advances posted to your account during a billing cycle will not incur a finance charge for that billing cycle if you had a zero or credit balance at the beginning of that billing cycle, or if you paid the entire new balance on the previous cycle s billing statement by the payment due date of that statement; otherwise a finance charge will accrue from the date you get a cash advance or the first day of the billing cycle in which the cash advance is posted to your account, whichever is later. To avoid an additional finance charge on the balance of cash advances, you must pay the entire new balance on the billing statement by the payment due date of that statement. The finance charge is calculated separately for purchases and cash advances. For purchases, the finance charge is computed by applying the periodic rate to the average daily balance of purchases. To get the average daily balance of purchases, we take the beginning outstanding balance of purchases each day, add any new purchases, and subtract any payments and/or credits. This gives us the daily balance of purchases. Then, we add all the daily balances of purchases for the billing cycle together and divide the total by the number of days in the billing cycle. This gives us the average daily balance of purchases. Balance transfers are calculated in the same manner as purchases. For cash advances, the finance charge is computed by applying the periodic rate to the average daily balance of cash advances. To get the average daily balance of cash advances, we take the beginning outstanding balance of cash advances each day, add in any new cash advances, and subtract any payments and/or credits that we apply to the cash advance balance. This gives us the daily balance of cash advances. Then, we add all the daily balances of cash advances for the billing cycle together and divide the total by the number of days in the billing cycle. This gives us the average daily balance of cash advances. 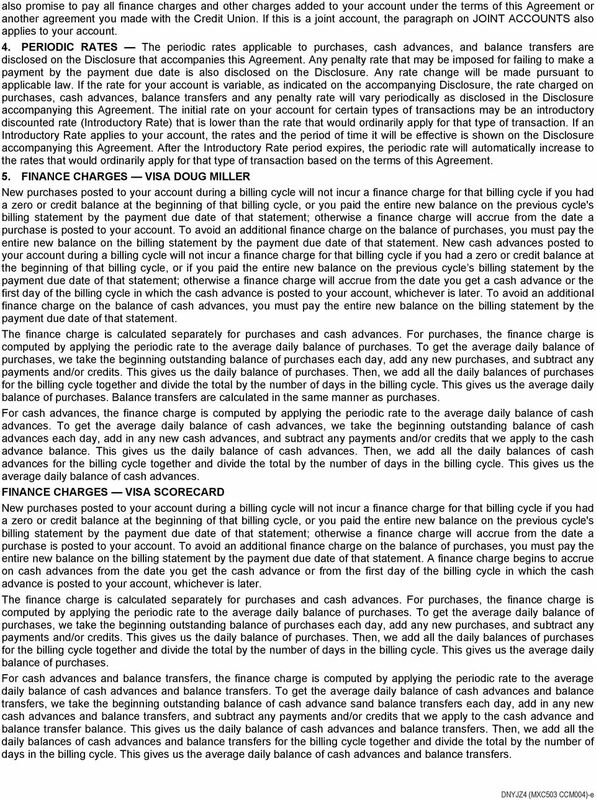 FINANCE CHARGES VISA SCORECARD New purchases posted to your account during a billing cycle will not incur a finance charge for that billing cycle if you had a zero or credit balance at the beginning of that billing cycle, or you paid the entire new balance on the previous cycle's billing statement by the payment due date of that statement; otherwise a finance charge will accrue from the date a purchase is posted to your account. To avoid an additional finance charge on the balance of purchases, you must pay the entire new balance on the billing statement by the payment due date of that statement. A finance charge begins to accrue on cash advances from the date you get the cash advance or from the first day of the billing cycle in which the cash advance is posted to your account, whichever is later. The finance charge is calculated separately for purchases and cash advances. For purchases, the finance charge is computed by applying the periodic rate to the average daily balance of purchases. To get the average daily balance of purchases, we take the beginning outstanding balance of purchases each day, add any new purchases, and subtract any payments and/or credits. This gives us the daily balance of purchases. Then, we add all the daily balances of purchases for the billing cycle together and divide the total by the number of days in the billing cycle. This gives us the average daily balance of purchases. For cash advances and balance transfers, the finance charge is computed by applying the periodic rate to the average daily balance of cash advances and balance transfers. To get the average daily balance of cash advances and balance transfers, we take the beginning outstanding balance of cash advance sand balance transfers each day, add in any new cash advances and balance transfers, and subtract any payments and/or credits that we apply to the cash advance and balance transfer balance. This gives us the daily balance of cash advances and balance transfers. Then, we add all the daily balances of cash advances and balance transfers for the billing cycle together and divide the total by the number of days in the billing cycle. This gives us the average daily balance of cash advances and balance transfers. 3 6. FOREIGN TRANSACTIONS Purchases and cash advances made in foreign currencies will be debited from your account in U.S. dollars. The exchange rate between the transaction currency and the billing currency used for processing international transactions is a rate selected by Visa from a range of rates available in wholesale currency markets for the applicable central processing date, which rate may vary from the rate Visa itself receives or the government-mandated rate in effect for the applicable central processing date. The exchange rate used on the processing date may differ from the rate that would have been used on the purchase date or cardholder statement posting date. A fee (finance charge), calculated in U.S. dollars, will be imposed on all foreign transactions, including purchases, cash advances and credits to your account. A foreign transaction is any transaction that you complete or a merchant completes on your card outside of the United States, with the exception of U.S. military bases, U.S. territories, U.S. embassies or U.S. consulates. The Foreign Transaction Fee is set forth on the Disclosure accompanying this Agreement. 7. FEES In addition to the periodic rate, the following additional fees may be imposed on your account. If applicable to your account, the fee amounts and explanations are disclosed on the Disclosure accompanying this Agreement. Your account may also be subject to additional fees as set forth on the Disclosure accompanying this Agreement. a. Annual Fee. If your account is subject to an Annual Fee, the fee will be charged to your account. The fee may be charged each year until your account is closed and/or paid in full. b. Account Set-Up Fee. If your account is subject to an Account Set-up Fee, a fee will be charged when you apply for a credit card account. c. Program Fee. 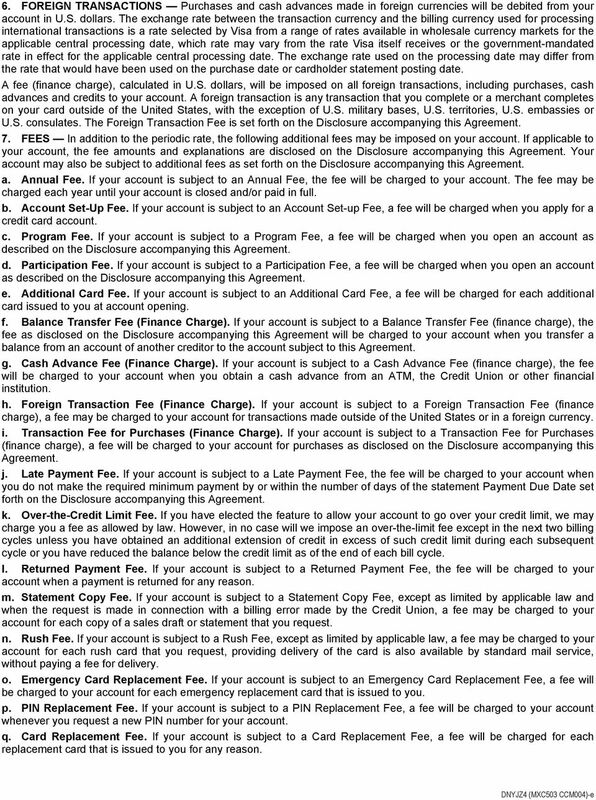 If your account is subject to a Program Fee, a fee will be charged when you open an account as described on the Disclosure accompanying this Agreement. d. Participation Fee. If your account is subject to a Participation Fee, a fee will be charged when you open an account as described on the Disclosure accompanying this Agreement. e. Additional Card Fee. If your account is subject to an Additional Card Fee, a fee will be charged for each additional card issued to you at account opening. f. Balance Transfer Fee (Finance Charge). If your account is subject to a Balance Transfer Fee (finance charge), the fee as disclosed on the Disclosure accompanying this Agreement will be charged to your account when you transfer a balance from an account of another creditor to the account subject to this Agreement. g. Cash Advance Fee (Finance Charge). If your account is subject to a Cash Advance Fee (finance charge), the fee will be charged to your account when you obtain a cash advance from an ATM, the Credit Union or other financial institution. h. Foreign Transaction Fee (Finance Charge). If your account is subject to a Foreign Transaction Fee (finance charge), a fee may be charged to your account for transactions made outside of the United States or in a foreign currency. i. Transaction Fee for Purchases (Finance Charge). If your account is subject to a Transaction Fee for Purchases (finance charge), a fee will be charged to your account for purchases as disclosed on the Disclosure accompanying this Agreement. j. Late Payment Fee. If your account is subject to a Late Payment Fee, the fee will be charged to your account when you do not make the required minimum payment by or within the number of days of the statement Payment Due Date set forth on the Disclosure accompanying this Agreement. k. Over-the-Credit Limit Fee. If you have elected the feature to allow your account to go over your credit limit, we may charge you a fee as allowed by law. However, in no case will we impose an over-the-limit fee except in the next two billing cycles unless you have obtained an additional extension of credit in excess of such credit limit during each subsequent cycle or you have reduced the balance below the credit limit as of the end of each bill cycle. l. Returned Payment Fee. If your account is subject to a Returned Payment Fee, the fee will be charged to your account when a payment is returned for any reason. m. Statement Copy Fee. If your account is subject to a Statement Copy Fee, except as limited by applicable law and when the request is made in connection with a billing error made by the Credit Union, a fee may be charged to your account for each copy of a sales draft or statement that you request. n. Rush Fee. If your account is subject to a Rush Fee, except as limited by applicable law, a fee may be charged to your account for each rush card that you request, providing delivery of the card is also available by standard mail service, without paying a fee for delivery. o. Emergency Card Replacement Fee. If your account is subject to an Emergency Card Replacement Fee, a fee will be charged to your account for each emergency replacement card that is issued to you. p. PIN Replacement Fee. If your account is subject to a PIN Replacement Fee, a fee will be charged to your account whenever you request a new PIN number for your account. q. Card Replacement Fee. If your account is subject to a Card Replacement Fee, a fee will be charged for each replacement card that is issued to you for any reason. 4 r. Unreturned Card Fee. If your account is subject to an Unreturned Card Fee, the fee will be charged to your account when any card(s) are not surrendered at our request for over-limit delinquency or any other reason set forth on the Disclosure accompanying this Agreement. 8. PAYMENTS Each month you must pay at least the minimum payment shown on your statement by the date specified on the statement. You may pay more frequently, pay more than the minimum payment or pay the total new balance in full. If you make extra or larger payments, you are still required to make at least the minimum payment each month your account has a balance (other than a credit balance). The minimum payment is 1.50% of your total new balance, or $10.00, whichever is greater, plus the amount of any prior minimum payments that you have not made, all outstanding unpaid fees and charges, and any amount you are over your credit limit by the date specified on the statement. The Credit Union also has the right to demand immediate payment of any amount by which you are over your credit limit. In accordance with applicable law, the Credit Union may not post payments to your account or reflect them in your available credit limit on the date they are received. The Credit Union may delay replenishing your credit limit until the date the payment is posted or the Credit Union confirms the payment has cleared. 9. PAYMENT ALLOCATION Subject to applicable law, your payments may be applied to what you owe the Credit Union in any manner the Credit Union chooses. However, in every case, in the event you make a payment in excess of the required minimum periodic payment, the Credit Union will allocate the excess amount first to the balance with the highest annual percentage rate and any remaining portion to the other balances in descending order based on applicable annual percentage rate. 10. SECURITY INTEREST You grant the Credit Union a security interest under the Uniform Commercial Code and under any common law rights the Credit Union may have in any goods you purchase. If you give the Credit Union a specific pledge of shares by signing a separate pledge of shares, your pledged shares will secure your account. You may not withdraw amounts that have been specifically pledged to secure your account until the Credit Union agrees to release all or part of the pledged amount. Your Account is secured by all other shares you have in any individual or joint account with the Credit Union, except for shares in an Individual Retirement Account or in any other account that would lose special tax treatment under state or federal law if given as security. These other shares may be withdrawn unless you are in default under this agreement. You authorize the Credit Union to apply the balance in your individual or joint share accounts to pay any amounts due on your Account if you should default. Collateral securing other loans you have with the Credit Union may also secure this loan, except that a dwelling will never be considered as security for this account, notwithstanding anything to the contrary in any other agreement. 11. DEFAULT You will be in default if you fail to make any minimum payment or other required payment by the date that it is due. You will be in default if you break any promise you make under this Agreement. You will be in default if you die, file for bankruptcy or become insolvent, that is, unable to pay your obligations when they become due. You will be in default if you make any false or misleading statements in any credit application or credit update. You will also be in default if something happens that the Credit Union believes may substantially reduce your ability to repay what you owe. When you are in default, the Credit Union has the right to demand immediate payment of your full account balance without giving you notice. If immediate payment is demanded, you agree to continue paying finance charges at the periodic rate charged before default, until what you owe has been paid, and any shares that were given as security for your account may be applied towards what you owe. 12. LIABILITY FOR UNAUTHORIZED USE-LOST/STOLEN CARD NOTIFICATION You agree to notify us immediately, orally or in writing, at FIS, Roosevelt Blvd., St. Peters or telephone seven (7) days a week, 24 hours a day, of the loss, theft, or unauthorized use of your credit card. You may be liable for the unauthorized use of your credit card. You will not be liable for unauthorized use that occurs after you notify us of the loss, theft, or possible unauthorized use. You will have no liability for unauthorized transactions made with your credit card, unless you are grossly negligent in the handling of your card. In any case, your liability will not exceed $ CHANGING OR TERMINATING YOUR ACCOUNT As permitted by law, the Credit Union may change the terms of this Agreement and any attached Disclosure from time to time. Notice of any change will be given in accordance with applicable law. If permitted by law and specified in the notice to you, the change will apply to your existing account balance as well as to future transactions. If your account has no activity and a zero balance for 18 months, we will close your account. Either you or the Credit Union may terminate this Agreement at any time, but termination by you or the Credit Union will not affect your obligation to pay the account balance plus any finance and other charges you owe under this Agreement. Your obligation to pay the account balance plus any finance and other charges you owe under this agreement are subject to all applicable laws and regulations regarding repayment requirements. You are also responsible for all transactions made to your account after termination, unless the transactions were unauthorized. The card or cards you receive remain the property of the Credit Union and you must recover and surrender to the Credit Union all cards upon request or upon termination of this Agreement whether by you or the Credit Union. If this is a joint account, the paragraph on JOINT ACCOUNTS of this Agreement also applies to termination of the account. 5 14. CHANGING OR TERMINATING AUTHORIZED USERS Upon your request, we may issue additional cards for authorized users that you designate. You must notify us in writing of any termination of an authorized user's right to access your account. Your letter must include the name of the authorized user and your account number and/or any subaccount number issued to the authorized user along with the authorized user's card and any convenience or other access checks issued to the authorized user. If you cannot return the authorized user's card or access checks and if you request your account to be closed, we will close your account and you may apply for a new account. 15. CREDIT REVIEW AND RELEASE OF INFORMATION You authorize the Credit Union to investigate your credit standing when opening or reviewing your account. You authorize the Credit Union to disclose information regarding your account to credit bureaus and creditors who inquire about your credit standing. If your account is eligible for emergency cash and/or emergency card replacement services, and you request such services, you agree that we may provide personal information about you and your account that is necessary to provide you with the requested service(s). 16. RETURNS AND ADJUSTMENTS Merchants and others who honor your card may give credit for returns or adjustments, and they will do so by sending the Credit Union a credit slip which will be posted to your account. If your credits and payments exceed what you owe the Credit Union, the amount will be applied against future purchases and cash advances. If the credit balance amount is $1.00 or more, it will be refunded upon your written request or automatically after six months. 17. ADDITIONAL BENEFITS/CARD ENHANCEMENTS The Credit Union may from time to time offer additional services to your account, such as travel accident insurance, at no additional cost to you. You understand that the Credit Union is not obligated to offer such services and may withdraw or change them at any time. 18. MERCHANT DISPUTES The Credit Union is not responsible for the refusal of any merchant or financial institution to honor your card. 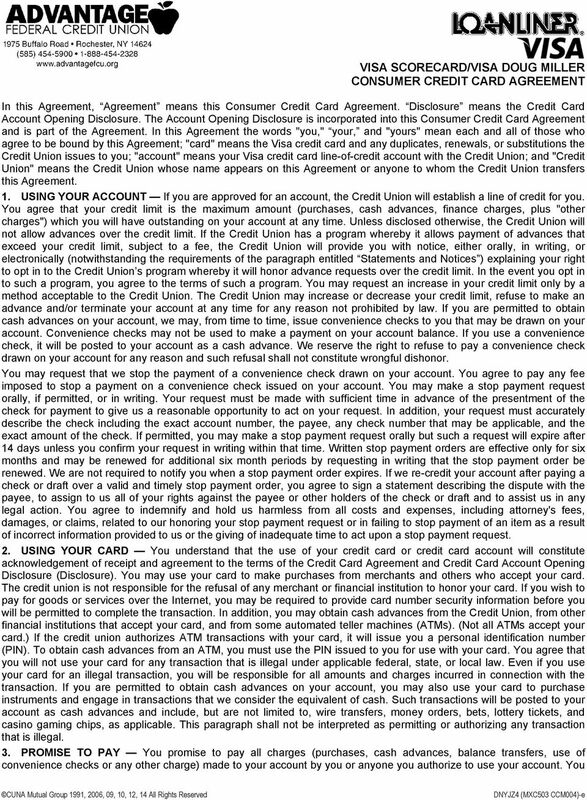 The Credit Union is subject to claims and defenses (other than tort claims) arising out of goods or services you purchase with the card if you have made a good faith attempt but have been unable to obtain satisfaction from the merchant or service provider, and (a) your purchase was made in response to an advertisement the Credit Union sent or participated in sending to you; or (b) your purchase cost more than $50.00 and was made in your state or within 100 miles of your home. 19. JOINT ACCOUNTS If this is a joint account, each of you will be individually and jointly responsible for paying all amounts owed under this Agreement. This means that the Credit Union can require any one of you individually to repay the entire amount owed under this Agreement. Each of you authorizes the other(s) to make purchases or cash advances individually. Any one of you may terminate the account and the termination will be effective as to all of you. 20. EFFECT OF AGREEMENT This Agreement is the contract which applies to all transactions on your account even though the sales, cash advances, credit or other slips you sign or receive may contain different terms. 21. NO WAIVER The Credit Union can delay enforcing any of its rights any number of times without losing them. 22. STATEMENTS AND NOTICES Statements and notices will be mailed or delivered to you at the appropriate address you have given the Credit Union. Notice sent to any one of you will be considered notice to all. 23. SEVERABILITY AND FINAL EXPRESSION This Agreement and the Disclosure are the final expression of the terms and conditions of your account. This written Agreement and Disclosure may not be contradicted by evidence of any alleged oral agreement. Should any part of this Agreement or the Disclosure be found to be invalid or unenforceable, all other parts of this Agreement and Disclosure shall remain in effect and fully enforceable to the fullest extent possible under this Agreement. 24. COPY RECEIVED You acknowledge that you have received a copy of this Agreement and Disclosure. 25. INTERNET GAMBLING TRANSACTIONS PROHIBITED You may not use your card to initiate any type of electronic gambling transaction through the Internet. 26. PENALTY RATE DISCLOSURES If applicable to your account, all rates for your account, including the rates for purchases, cash advances, and balance transfers, will increase to the Penalty Rate when you meet one or more of the conditions as set forth in the Disclosure accompanying this Agreement. Any rate increases applied to your account are subject to applicable notice requirements. Please refer to the Disclosure for additional information regarding the Penalty Rate. 27. VOLUNTARY PAYMENT PROTECTION We may offer Voluntary Payment Protection to you. Voluntary Payment Protection is not necessary to obtain credit. If you purchase Voluntary Payment Protection from us, you authorize us to add the fees or insurance charges monthly to your loan balance and charge you interest on the entire balance. At our option we will change your payment or the period of time necessary to repay the loan balance. The rate used to determine the fees or insurance charges may change in the future. If the rate changes, we will provide any notices required by applicable law. 28. 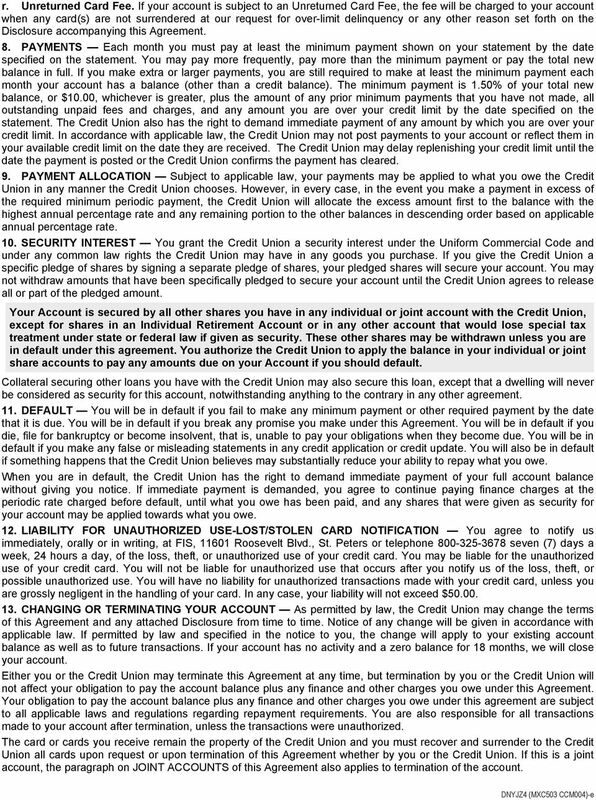 NOTICE TO UTAH BORROWERS This written agreement is a final expression of the agreement between you and the Credit Union. This written agreement may not be contradicted by evidence of any oral agreement. 29. The following is required by Vermont law NOTICE TO CO-SIGNER YOUR SIGNATURE ON THIS NOTE MEANS THAT YOU ARE EQUALLY LIABLE FOR REPAYMENT OF THIS LOAN. IF THE BORROWER DOES NOT PAY, THE LENDER HAS A LEGAL RIGHT TO COLLECT FROM YOU. 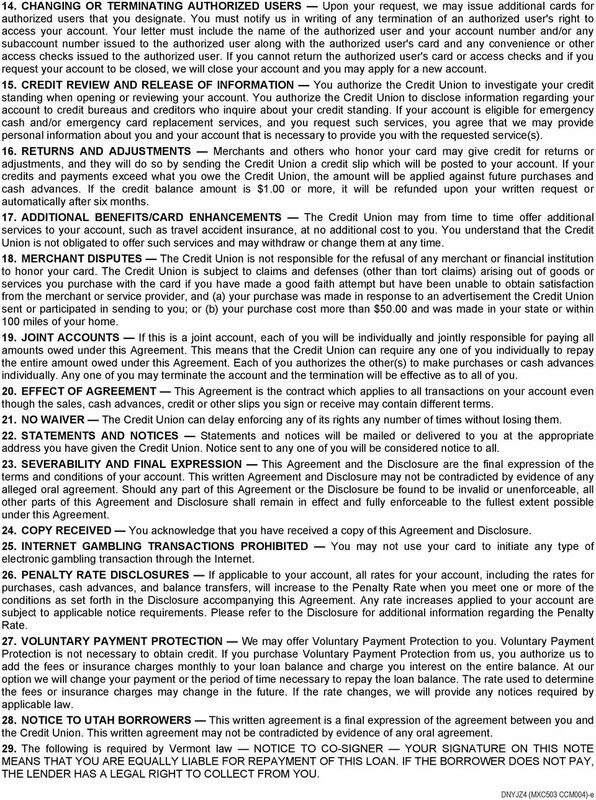 6 Your Billing Rights: Keep this Document for Future Use This notice tells you about your rights and our responsibilities under the Fair Credit Billing Act. What To Do If You Find A Mistake On Your Statement If you think there is an error on your statement, write to us at the address listed on your statement. In your letter, give us the following information: - Account information: Your name and account number. - Dollar amount: The dollar amount of the suspected error. - Description of problem: If you think there is an error on your bill, describe what you believe is wrong and why you believe it is a mistake. You must contact us: - Within 60 days after the error appeared on your statement. - At least 3 business days before an automated payment is scheduled, if you want to stop payment on the amount you think is wrong. You must notify us of any potential errors in writing or electronically. You may call us, but if you do we are not required to investigate any potential errors and you may have to pay the amount in question. What Will Happen After We Receive Your Letter When we receive your letter, we must do two things: 1. Within 30 days of receiving your letter, we must tell you that we received your letter. We will also tell you if we have already corrected the error. 2. Within 90 days of receiving your letter, we must either correct the error or explain to you why we believe the bill is correct. While we investigate whether or not there has been an error: - We cannot try to collect the amount in question, or report you as delinquent on that amount. - The charge in question may remain on your statement, and we may continue to charge you interest on that amount. - While you do not have to pay the amount in question, you are responsible for the remainder of your balance. - We can apply any unpaid amount against your credit limit. After we finish our investigation, one of two things will happen: - If we made a mistake: You will not have to pay the amount in question or any interest or other fees related to that amount. - If we do not believe there was a mistake: You will have to pay the amount in question, along with applicable interest and fees. We will send you a statement of the amount you owe and the date payment is due. We may then report you as delinquent if you do not pay the amount we think you owe. 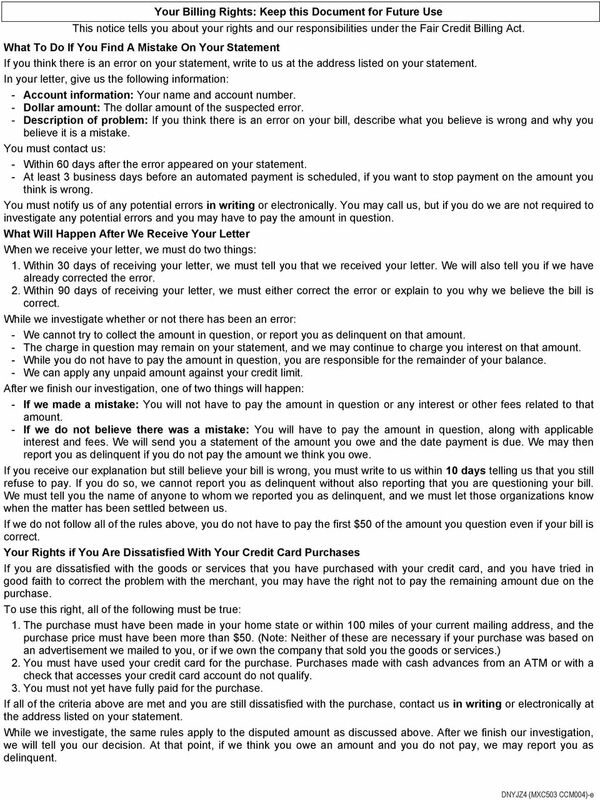 If you receive our explanation but still believe your bill is wrong, you must write to us within 10 days telling us that you still refuse to pay. If you do so, we cannot report you as delinquent without also reporting that you are questioning your bill. We must tell you the name of anyone to whom we reported you as delinquent, and we must let those organizations know when the matter has been settled between us. If we do not follow all of the rules above, you do not have to pay the first $50 of the amount you question even if your bill is correct. Your Rights if You Are Dissatisfied With Your Credit Card Purchases If you are dissatisfied with the goods or services that you have purchased with your credit card, and you have tried in good faith to correct the problem with the merchant, you may have the right not to pay the remaining amount due on the purchase. To use this right, all of the following must be true: 1. The purchase must have been made in your home state or within 100 miles of your current mailing address, and the purchase price must have been more than $50. (Note: Neither of these are necessary if your purchase was based on an advertisement we mailed to you, or if we own the company that sold you the goods or services.) 2. You must have used your credit card for the purchase. Purchases made with cash advances from an ATM or with a check that accesses your credit card account do not qualify. 3. You must not yet have fully paid for the purchase. If all of the criteria above are met and you are still dissatisfied with the purchase, contact us in writing or electronically at the address listed on your statement. While we investigate, the same rules apply to the disputed amount as discussed above. After we finish our investigation, we will tell you our decision. At that point, if we think you owe an amount and you do not pay, we may report you as delinquent.